The Fish diagram is the classic way to look at the properties of a water/oil system. 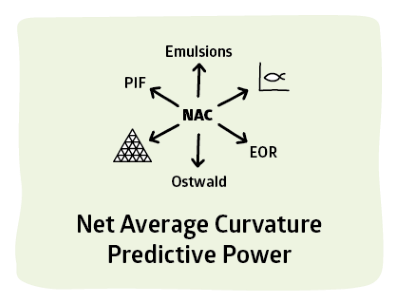 The amazing fact is that you can predict a fish diagram from HLD-NAC. Which means that you can see not just what happens when temperatures change (the classic fish with ethoxylates), but what happens with salinity, EACN or Cc changes. This is an expert-level app, but taken step by step it's not at all hard and the benefits of understanding it are huge! The fish diagram is much used in surfactant theory. Its name comes from the fact that the key lines in the graph cross at a specific point which makes that part of the plot look a bit like a fish tail. The head of the fish is a sudden halt at the point of the CMC and is not shown in the diagrams here. The plot has surfactant concentration on the x-axis and most frequently temperature on the y-axis. However, all such plots are merely one slice through the complexities of surfactant space and plots can be made just as well in terms of salinity, EACN and Cc. The Cc fish plot seems to be used rarely, which is unfortunate as it is most insightful. In fact the fish plot is generally useless to the practical formulator because it is (usually) defined as taking place with 50:50 o:w. Plots at other o:w ratios are more interesting as is a fishtail plot which is discussed in the next section. For now it's important to focus on the fish diagram itself. The controls contain many familiar HLD-NAC inputs. The new options MWt, A, L for the surfactant (Molecular Weight, Head Area, Tail Length), the MVol (Molar Volume = MWt/Density) for the oil and and the need for two Cc and EACN values are explained in words below and many aspects are explained visually if the What option is clicked. What the fish diagram does is show you the effect of varying the % surfactant (expressed with respect to the whole formulation) on the phase that would be found at a given value of the chosen variable: T, Salinity, Cc or EACN. If there is a meaningful fish diagram for your given setup (for example an APG gives NO T-fish because it has no temperature sensitivity) then there is an upper phase line which decreases with increasing surfactant, a lower phase line which increases with increasing surfactant and a fish-tail point where the lines cross. This is the Type IV point where there is sufficient surfacant to give a totally homogeneous solution. Of more general interest is the question: "at a given % surfactant, as I change the chosen variable when will I pass from Type I through Type III to Type II?" Remember the fish diagram is merely a convenient 2D slice through multidimensional surfactant space. So this question is answered when all the other parameters are assumed to be constant. The classic fish diagram is with ethoxylates and temperature. As you increase the temperature you go from a Type I to Type III at the "phase inversion temperature". One possibly confusing issue is that the slider for the chosen variable has no effect on the plot other than moving a dashed line to show the current value with respect to the fish. Suppose I want an S-fish. If I change the EACN, the T or the Cc, the plot changes, but if I change the S, nothing happens. That's because the S-fish is simply saying "Given T, Cc and EACN, what is the effect of changing S", so your chosen S value is of no significance. But if you chose a T plot, then the S slider would change the plot whilst the T slider would do nothing. For Cc and EACN plots this dashed line is not shown because the Cc and EACN values change the plot in other ways. The other complication is that the ξ parameter (click the What button and see the ξ parameter discussion in the NAC section) depends on A, L and the MVol of the oil. For T and S fish diagrams Cc2 and EACN2 are ignored and all properties are based on Cc1 and EACN1. However, for Cc and EACN fish diagrams it is only possible to create a diagram between the two Cc and two EACN values, using reasonable interpolations of the values for L and A and for EACN. There is some circularity in such calculations but an iterative process reaches a stable solution rather quickly. Obviously, changing Cc or EACN values change the scope of the plot. If they are set incorrectly then the plot might show nothing. Note that the Cc andEACN diagrams should be seen as illustrative rather than precise as the estimates of ξ will themselves have errors. 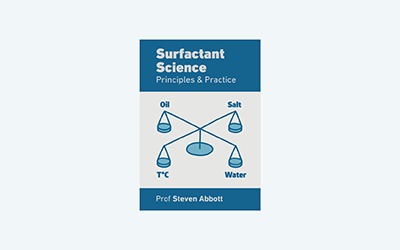 A key point of interest in the fish diagram is the effect of the properties of the surfactant. These are often ignored "it's just a surfactant". But, for example, reduce the MWt of the surfactant and you immediately see that the Type IV point decreases rapidly. In other words, for a lower MWt you need less surfactant to produce a homogeneous solution and in general get more "surfactancy" at lower MWt. The reason for this is obvious: for a given % surfactant you get more surfactant molecules at a lower MWt. The situation is very different with oligomeric and polymeric surfactants which are discussed in a later section. But you also get a bigger effect from a larger ξ parameter which depends on L, A and EACN. If you never use a fish diagram again, just remember how it demonstrates that the perfect surfactant (in terms of efficiency) is one with low MWt, and large ξ parameter. The fact that ξ decreases with large MVol values is consistent with the familiar notion that bigger oil molecules (which typically have large EACN values) are harder to solubilise. The "standard" for a fish diagram is 50:50 O:W. This is useless for understanding what happens at more realistic ratios of O:W. For example, those who formulate using the PIT technique with ethoxylates have no interest in a phase inversion at 50:50 O:W which requires, say, 20% surfactant. This issue and the addition of a "fishtail plot" are discussed in the next section.